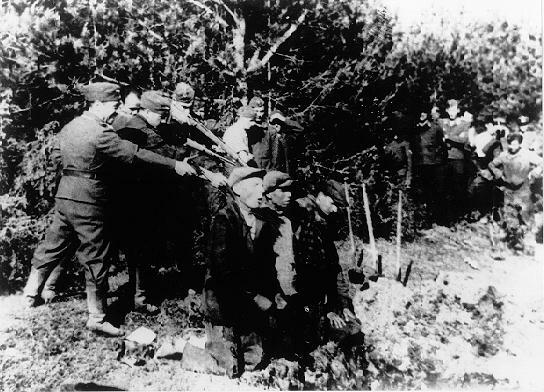 An execution by einsatzgruppen using small arms. Most people who think of the Holocaust think first of extermination camps like Auschwitz – but the first killings of the Nazi Final Solution were actually carried out by soldiers in the field. In 1941 Nazi commanders formed a number of mobile killing squads called einsatzgruppen (German for ‘action group’). The einsatzgruppen were comprised of paramilitary personnel from the Schutzstaffel (SS). Among their ranks were both conscripts and volunteers. Many units also led by men with investigative or policing experience, who had seconded from the Gestapo or German civilian police units like the Kripo and Orpo. The first record of einsatzgruppen formations dated back to 1938, when small squadrons were coddled together and sent into Austria and Czechoslovakia after the Nazi annexations. Their mission there was to locate, detain or silence dissidents and troublemakers. Platoons of einsatzgruppen also followed the Nazi blitzkrieg into western Poland in 1939; once again their orders were to eliminate political threats, dissenters or potential resistance leaders. The Nazi conquest of Europe brought about the expansion of the SS einsatzgruppen and changes to its composition. By early 1941 the einsatzgruppen had swelled into four divisions, labelled A, B, C and D. Each division was comprised of several companies or platoons and contained between 700 and 1,000 men. Einsatzgruppen divisions were ordered to follow the Wehrmacht as it advanced into enemy territory. Once an area had been secured by the army, the task of the einsatzgruppen was to identify, round up, assemble and exterminate “undesirables”, particularly Jews, Romany and communists. The einsatzgruppen operated under strict rules of engagement to minimise disruption and conceal their grisly duties. Executions had to take place well away from Aryan or non-Jewish populations. Bodies were carefully disposed of in remote locations, away from farmland or areas likely to be cultivated or developed. Graves could not be marked or otherwise identifiable. Records of numbers “liquidated” were to be kept; statistical reports were to be compiled, checked and sent to SS headquarters. The first significant deployment of the einsatzgruppen as mobile death squads was during Operation Barbarossa, the Nazi invasion of Soviet Russia (June 1941). Another einsatzgruppen unit, unaccompanied by any substantial Wehrmacht divisions, was based further south in the Ukraine. In both locations the einsatzgruppen moved from village to village, executing any ‘undesirables’ it could locate. 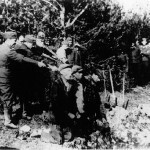 The vast majority of einsatzgruppen killings were carried out by small arms fire: rifles, pistols and sub-machine guns. Victims were often forced to dig their own graves, before being lined up at the edge and shot. Later this progressed to the digging of large pits, mass executions and burying of bodies in piles of layers. Executioners sometimes forced horrified victims to enter the pits and stand on the bodies of those already murdered. The pits were then filled it, regardless of whether those inside were actually dead. As the main function of the einsatzgruppen was killing, many of its officers became interested in trialling new and more efficient methods. This was driven by some extent to the constant pressure to use fewer men and less ammunition. But there was also concern about the psychological impact that these constant killings were having on the men of the einsatzgruppen – particularly when their victims included large numbers of women and children. A significant advance followed a 1941 incident where German soldiers died after being trapped in the compartment of a truck with a faulty exhaust. Seizing on this idea, one einsatzgruppen company sealed the cargo sections of large trucks and began gassing victims by filling the truck with its own exhaust fumes. Not only were these trucks mobile, they could exterminate dozens of prisoners quickly, without expending ammunition and out of sight of SS men. July 4th – Kauen-Fort VII – 416 Jews, 47 Jewesses – 463 [total]. July 6th – Kauen-Fort VII – Jews 2,514. July 7th – Mariampole – Jews 32. July 8th – Mariampole – 14 Jews, 5 communist officials – 19 [total]. July 8th – Girkalinei – 6 communist officials. July 9th – Wendziogala – 32 Jews, 2 Jewesses, 1 Lithuanian, 2 Lithuanian communists, 1 Russian communist – 38 [total]. July 9th – Kauen-Fort VII – 21 Jews, 3 Jewesses – 24 [total]. Causing or witnessing the deaths of scores of people, including women and children, took its toll on the men of the einsatzgruppen. Not all posted to einsatzgruppen units were capable of carrying out their work; there were several recorded cases of men breaking down, refusing orders or being hastily transferred. Einsatzgruppen officers, aware of the difficulties faced by their men, tended to be more tolerant of occasional breaches of discipline. Many unit leaders dispensed extra rations of alcohol as an incentive or reward. In comparison to other SS and Wehrmacht divisions, the einsatzgruppen recorded much higher rates of alcoholism, desertion and suicide. Yet despite this moral uncertainty and internal unrest, the einsatzgruppen was able to continue its deadly campaign. It would last until the summer of 1943, by which time transportation to the death camps became the preferred method of mass killing. Historians have laid responsibility for more than one million deaths at the feet of the einsatzgruppen and their two-year campaign of death. Their role in the Holocaust was so significant that the Nuremberg war crimes tribunal convened a separate ‘einsatzgruppen trial’ in 1947-48. These trials considered the fate of 24 einsatzgruppen commanders, who were charged with war crimes, crimes against humanity and membership of illegal organisations. Of the two dozen men charged, 21 were found guilty (three died or committed suicide during the trial) and 14 were sentenced to death – however only four were executed and all surviving defendants had been released from prison within ten years. 1. The einsatzgruppen were mobile killing squads, charged with exterminating ‘undesirables’ in occupied Europe. 2. It contained four divisions of SS troopers, filled with volunteers and conscripts, some from police backgrounds. 3. From 1941 the einsatzgruppen murdered more than one million people, mostly civilian Jews and other minorities. 4. The einsatzgruppen usually operated behind the army, moving from village to village, killing and disposing of bodies. 5. This grisly task took its toll on einsatzgruppen units, which were stricken with alcoholism and other problems.